The exposed surface area of the dipping tank should be minimised to reduce evaporation of the solvents and limit exposure of air to moisture sensitive conformal coatings. Use a two-tank system with a recirculating pump. The dipping tank will stay level and gives an exact dipping depth for precision dipping. If using electronics in the dip system such as viscometers, heating systems and temperature control systems ensure they meet the correct HSE standards such as ATEX to avoid flammability and explosion problems. Avoid parts that are direct with the coating material if possible. This will avoid unnecessary maintenance. Reduce the extraction airflow across the tank to the minimum allowed for Health and Safety needs. This minimises solvent evaporation and a significant change in viscosity. 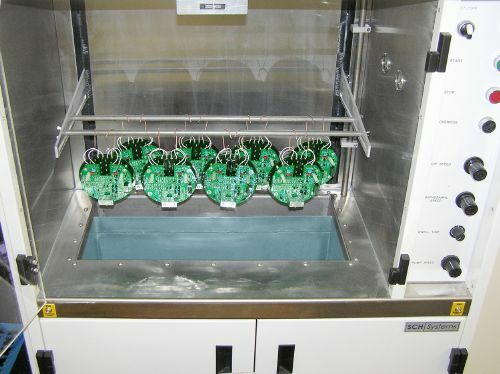 Click Conformal Coating Dip Systems for further information. When using a conformal coating dipping system it is important to know that the dry film conformal coating thickness is correct on the circuit board. Ultimately, the conformal coating will only be protective if applied at the right thickness so control of the process is crucial. These three parameters ultimately control the final thickness of the conformal coating on the circuit. Change one of the these and you can change significantly the conformal coating thickness. Once this is set up and everything is in order we now want to monitor the coating thickness. Option one: Measure the circuit board directly. If this is not the case there is an alternative solution. If the conformal coating thickness is correct on a circuit board when qualifying the process then it is possible to dip a test coupon to measure the equivalent coating thickness. This then allows you to use a test coupon at the start of the day’s production process to confirm everything is in order and no parameters have changed. The process is the same as with measuring the circuit board. Dip the coupon. Dry it sufficient to measure the coating thickness and verify that the process is stable and there is no significant variation. This is an easy method that is reliable. It also backs up your viscosity control measurements for your conformal coating and ensures your conformal coating dip process is in control. 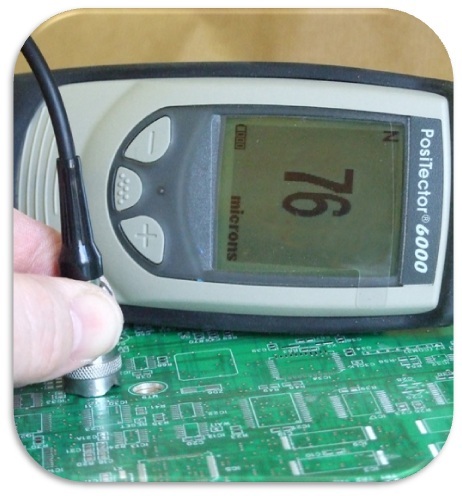 Click Conformal Coating Thickness Measurement for further information. 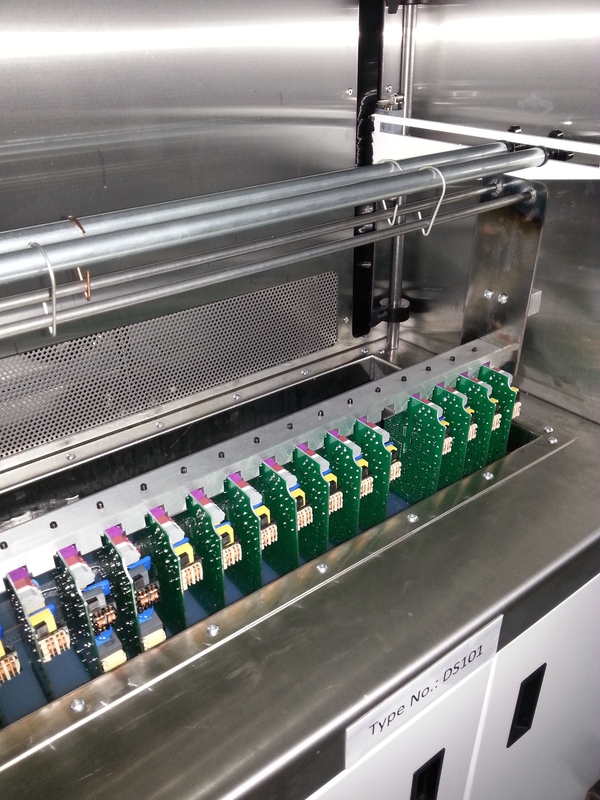 Can you use a moisture cure silicone conformal coating in a dipping machine? The answer is yes. It is done regularly and we have dip coating systems filled with moisture sensitive silicone materials that function perfectly. The key is the way the conformal coating and the process are set up. Follow these steps to ensure your silicone dip conformal coating process is successful. The coating may skin on the surface. Remove this whenever it occurs. Use a catch tray in the weir of the dip tank. When the congealed coating drops into the catch tray the lumps will be caught. Apply a moisture-free gas across the surface of the tank. This inhibits the moisture in air prematurely curing the coating. Minimise the pumping of the coating. Turn the speed down to a minimum and only pump the coating when in use. turn off the pump there are long periods of no coating. 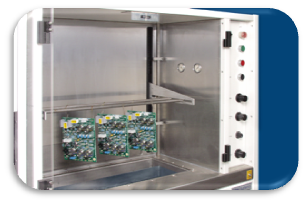 Contact us now to discuss your conformal coating dipping process and how we can help you.